We ship to all 50 states and our Military world wide via APO/FPO for a flat $14.75 and give you an on-site delivery date guarantee. After your order is placed, we will email you a guaranteed arrive on-site no later than date. Your order may even arrive pior to your guaranteed date. Enter a 5-digit delivery zip code for your estimated ON-SITE DELIVERY time. No other safety company will GUARANTEE you an on-site delivery date. We Will. Shortly after you place your order we will send you an email (during standard business day hours, Central Time) specifying the guaranteed by date, your order will arrive on your site. The date in this email is our GUARANTEED order delivery date. Our guaranteed delivery date is a "deliver no later than" date. Earlier delivery fulfills our delivery date guarantee. NOTE: No other date, verbal or written, will apply other than the date you receive via our email. This Guarantee applies only to orders shipped on SafetyBanners.Org UPS account number. A - You must notify us of your request for claim by email or telephone within 15 days from the date of the guaranteed delivery date as specified in our email. B - We must be advised of the receiving company name and address, date of guaranteed delivery and the UPS tracking number and proof of delivery. C - The guarantee does not apply when late delivery results from from events beyond our control or the control of UPS (force majeure) or due to any suspension of carriage by the United Parcel Service company. D - This guarantee apples only to shipments sent via the United Parcel Service company on the SafetyBanners.Org UPS account number. 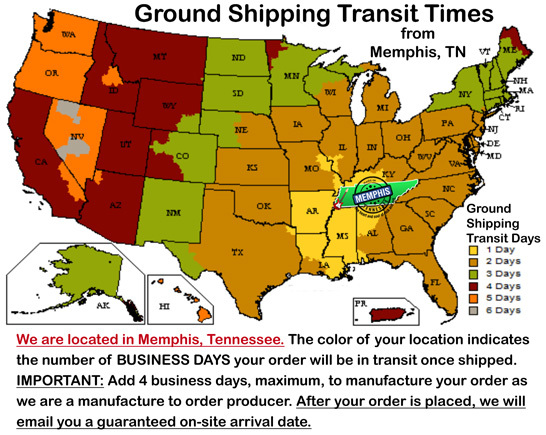 Shipments via APO, FPO or any other shipping service does not qualify for the delivery date guarantee. E - This guarantee does not apply if the delivery address is not entered correctly on the order by the ordering company. F - Delivery prior to our guaranteed delivery date fulfills our delivery date guarantee. For questions or comments about our guaranteed delivery date program please telephone us at 901-759-0932 Central Time or email us using the "Email Us" button above top center.